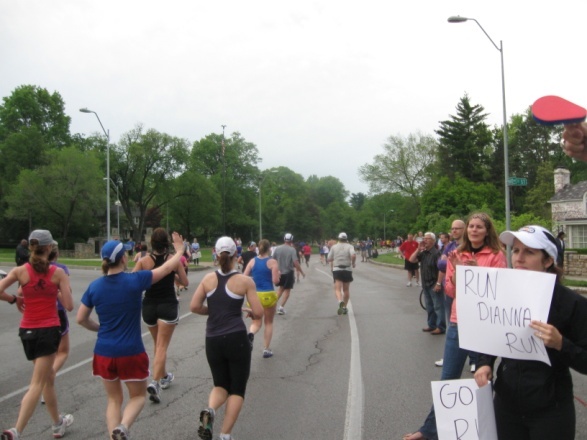 For years I wanted to attend one of Kansas City’s elite running races however without knowing anyone that was participating in the races there was no connection for me to attend. Anna Wolfe, one of the Team KCTC Ambassadors made a suggestion to establish a “Watch Party” to invite all the Kansas City Track Club members and friends to come together to cheer on the runners and walkers in the races. I personally thought this was a great idea not only to bring out members from the Kansas City Track Club but everyone in the Kansas City area. The watch parties help others who feel the same way as I did about the elite races. My hope is that some of the crowd at our watch parties will start walking or running after the race. They can also meet some of the members and feel like they can get connected into local group runs and activities that track club has. Anna suggested that the first “Watch Party” should be Rock the Parkway ½ Marathon and 5K Race, on April 14, 2012 at 64th and Ward Parkway (a little past the nine-mile marker). Anna made fliers for the party and we posted the information on our facebook page and twitter feed to get the word out for the new event. On the day of the race I arrived at the “Watch Party” location at 7:30 AM to setup a table with information about the Kansas City Track Club, noise makers, and posters boards/markers for sign making. It was a small crowd however everyone CHEERED their hearts out for the runners and walkers. The crowd displayed the signs they made and the runners and walkers in the race really appreciated it. I felt the “Watch Party” was a success since the location of the “Watch Party” really helped out the runner/walkers to take on the last few miles and drive for a hard finish. The next “Watch Party” will be at the Hospital Hill Run for June 2, 2012 and we are looking to establish a larger “Watch Party” with the same enthusiastic crowd as the first “Watch Party”. Everyone is welcome to attend! Please invite your family and friends. Location and time will be announced soon, watch out of the flier on the blog, facebook page and twitter! This blog post was written by our ambassador, Gabe Esteban. He has a love for running and getting to know others in the community who need a friend to help the start running or walking.